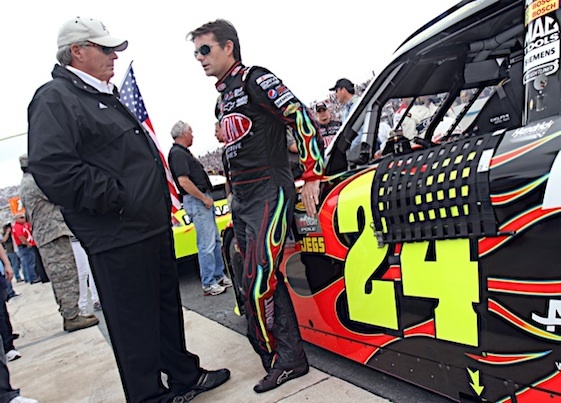 CONCORD, N.C. – Twenty-one years ago Jeff Gordon stepped into the spotlight on NASCAR’s Sprint Cup stage at Charlotte Motor Speedway. That night the then 22-year-old Hendrick Motorsports driver and his Ray Evernham-led crew outsmarted veteran Rusty Wallace and his Penske team on the competitors’ final stop in the Coca-Cola 600 to claim their first career victory in NASCAR’s premier series. Wallace’s crew followed the norm and gave their driver four fresh tires. Evernham broke the mold and provided Gordon’s potent Chevrolet with only two. That night it was described as a gamble, but two decades later the savvy Evernham admitted it was a planned move; one he had worked on for quite some time. That night the young Gordon was overcome with emotion and stunned everyone by sobbing in victory lane. This Sunday don’t expect tears, but it could be emotional when a mature and polished 43-year-old Gordon makes his final appearance in stock car racing’s longest race. Since that eventful night in 1994, Gordon has acquired five victories at the 1.5-mile track, three in the Coca-Cola 600. That accomplishment ties him with Dale Earnhardt and Richard Petty for third on the track’s all-time win list. His nine poles are second only to David Pearson’s 14. And in 44 starts he has recorded 17 top-five and 24 top-10 finishes. His average start is 10.5 and his average finish 15.5. There have been 10 DNFs, but winnings of more than $5 million. After Sunday, however, the book will be closed on Gordon’s Coca-Cola 600 statistics. Unlike any other year during his NASCAR career, Gordon will begin the day driving the pace car for the start of the Indianapolis 500. He’ll then fly to Charlotte to begin his Coca-Cola 600 duties where he’ll start 18th. This year neither Gordon nor any of his teammates were in contention for the pole that was claimed by Matt Kenseth. Still, that doesn’t dim what Gordon has accomplished at Charlotte Motor Speedway, especially in 1994. When that edition of the Coca-Cola 600 concluded, Gordon led Wallace by 3.91 seconds and he became the first driver to win the 600-mile race from the pole position since Pearson in 1976. Gordon also matched Pearson by winning the race in only his second start in the event. Pearson won his second 600 in 1961. “The final period on a sentence that Jeff Gordon had arrived,” Evernham said. On Sunday, Gordon places the final period on his Coca-Cola 600 career.